Source: Adapted from M. Blumberg and C.D. Pringle, “The Missing Opportunity in Organizational Research: Some Implications for a Theory of Work Performance,” Academy of Management Review, October 1982, p. 565. E X H I B I T 6–3 © 2005 Prentice Hall Inc. All rights reserved. 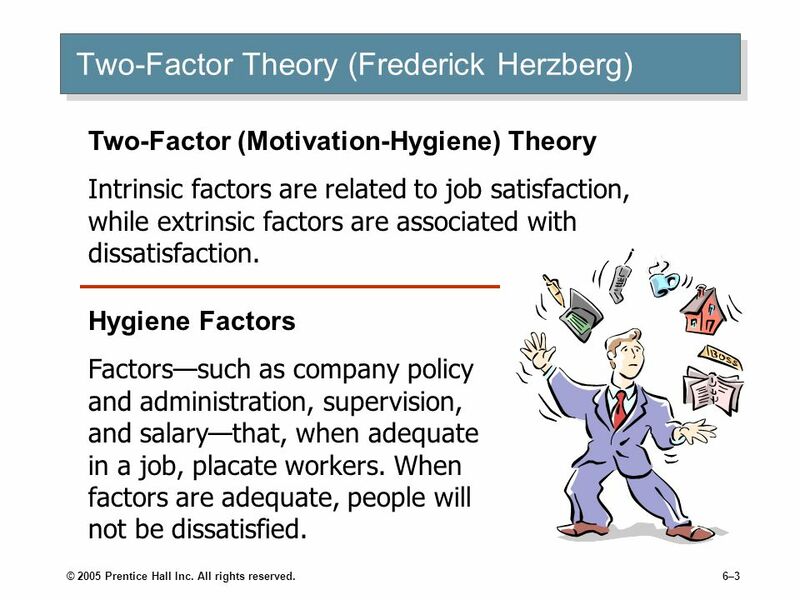 Two-Factor (Motivation-Hygiene) Theory Intrinsic factors are related to job satisfaction, while extrinsic factors are associated with dissatisfaction. Hygiene Factors Factors—such as company policy and administration, supervision, and salary—that, when adequate in a job, placate workers. When factors are adequate, people will not be dissatisfied. © 2005 Prentice Hall Inc. All rights reserved. 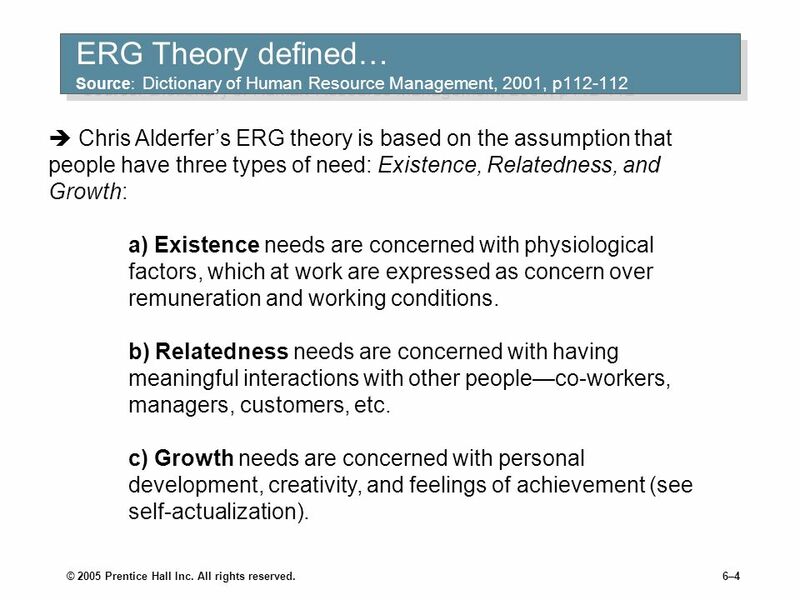  Chris Alderfer’s ERG theory is based on the assumption that people have three types of need: Existence, Relatedness, and Growth: a) Existence needs are concerned with physiological factors, which at work are expressed as concern over remuneration and working conditions. b) Relatedness needs are concerned with having meaningful interactions with other people—co-workers, managers, customers, etc. c) Growth needs are concerned with personal development, creativity, and feelings of achievement (see self-actualization). © 2005 Prentice Hall Inc. All rights reserved. The message for managers is that policies and practices must be devised to help satisfy these needs because this will result in fulfilled and motivated employees. 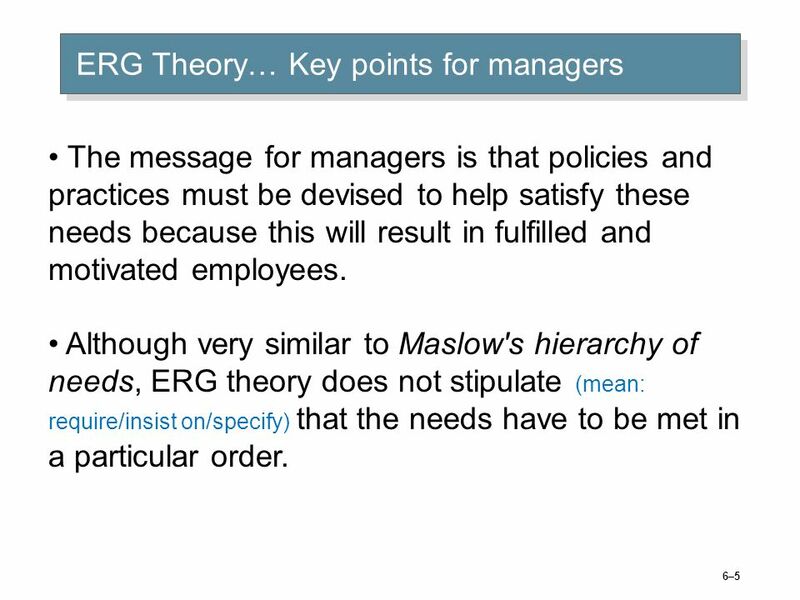 Although very similar to Maslow's hierarchy of needs, ERG theory does not stipulate (mean: require/insist on/specify) that the needs have to be met in a particular order. An individual’s specific needs are acquired over time and are shaped by one’s life experience. Most of these needs can be classified as under: Need for Achievement The drive to excel, to achieve in relation to a set of standards, to strive to succeed. Need for Affiliation The desire for friendly and close personal relationships. Need for Power The need to make others behave in a way that they would not have behaved otherwise. nAch nPow nAff © 2005 Prentice Hall Inc. All rights reserved. 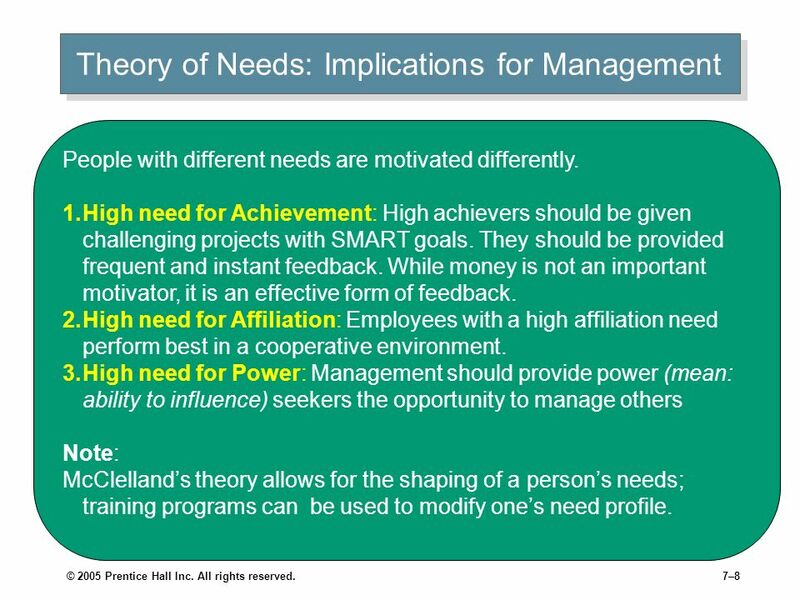 People with different needs are motivated differently. 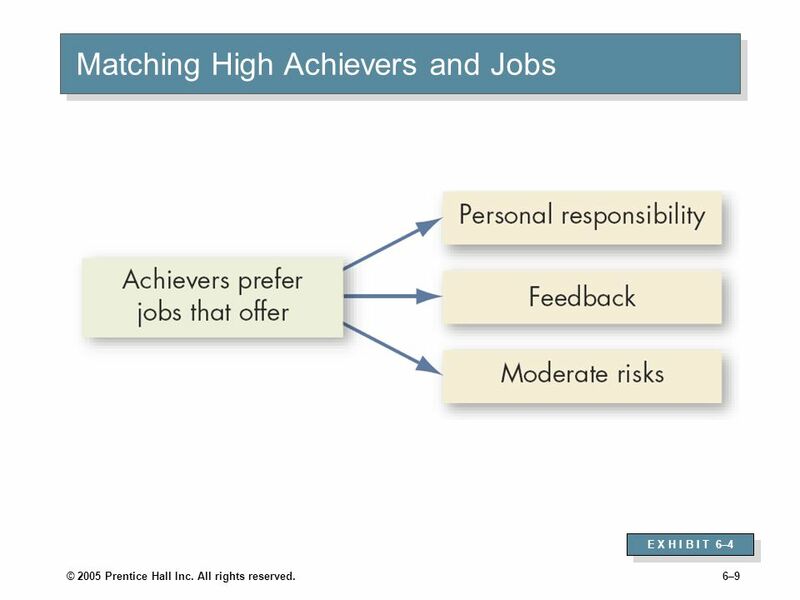 High need for Achievement: High achievers should be given challenging projects with SMART goals. They should be provided frequent and instant feedback. While money is not an important motivator, it is an effective form of feedback. High need for Affiliation: Employees with a high affiliation need perform best in a cooperative environment. 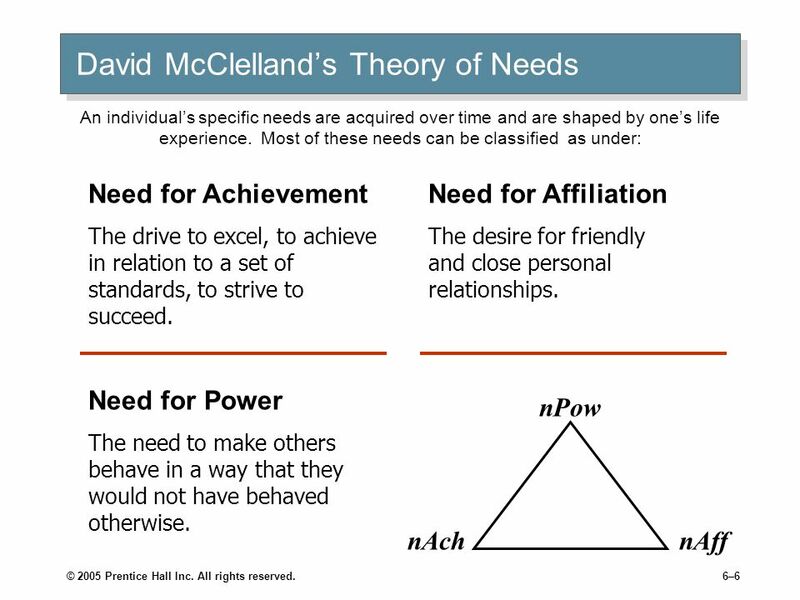 High need for Power: Management should provide power (mean: ability to influence) seekers the opportunity to manage others Note: McClelland’s theory allows for the shaping of a person’s needs; training programs can be used to modify one’s need profile. © 2005 Prentice Hall Inc. All rights reserved. E X H I B I T 6–4 © 2005 Prentice Hall Inc. All rights reserved. 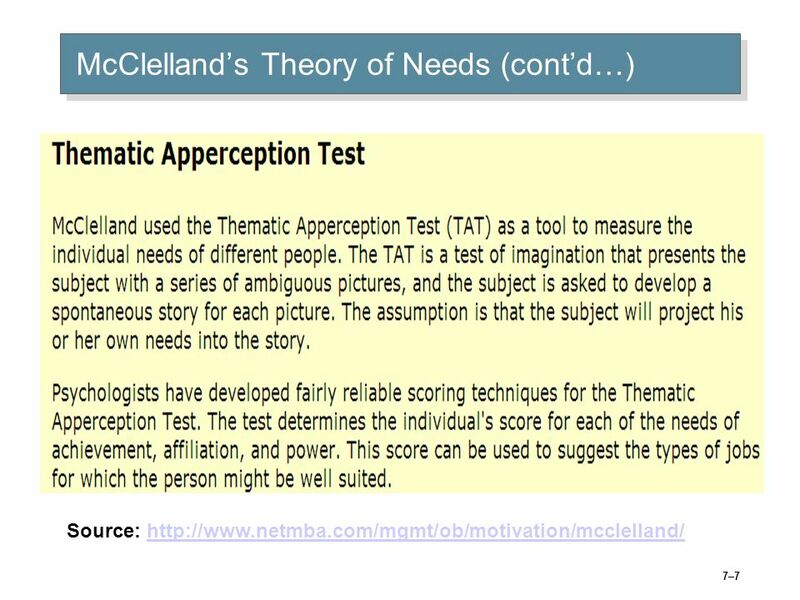 Description When looking at task, we evaluate it in terms of how well it meets our needs to feel competent and in control. If we think we will be able to complete the task, we will be intrinsically motivated to complete the task, requiring no further external motivation. 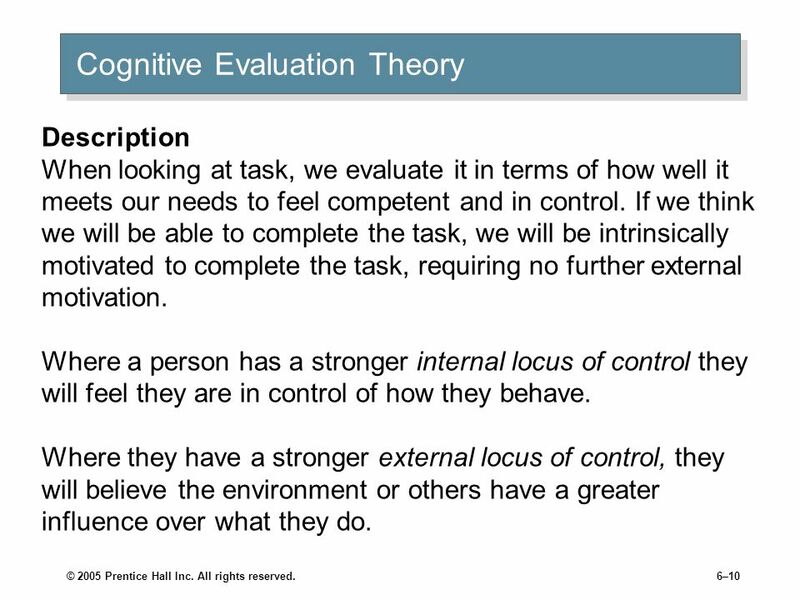 Where a person has a stronger internal locus of control they will feel they are in control of how they behave. Where they have a stronger external locus of control, they will believe the environment or others have a greater influence over what they do. © 2005 Prentice Hall Inc. All rights reserved. 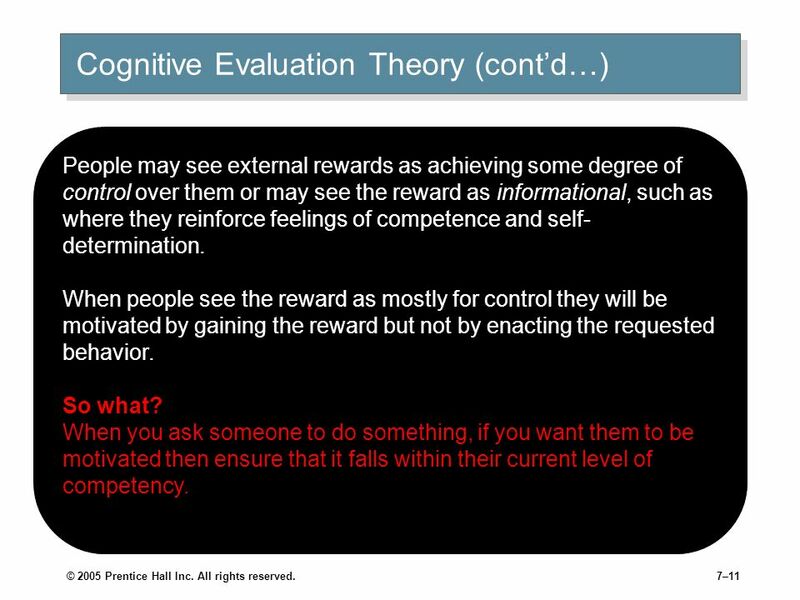 People may see external rewards as achieving some degree of control over them or may see the reward as informational, such as where they reinforce feelings of competence and self-determination. When people see the reward as mostly for control they will be motivated by gaining the reward but not by enacting the requested behavior. So what? When you ask someone to do something, if you want them to be motivated then ensure that it falls within their current level of competency. © 2005 Prentice Hall Inc. All rights reserved. 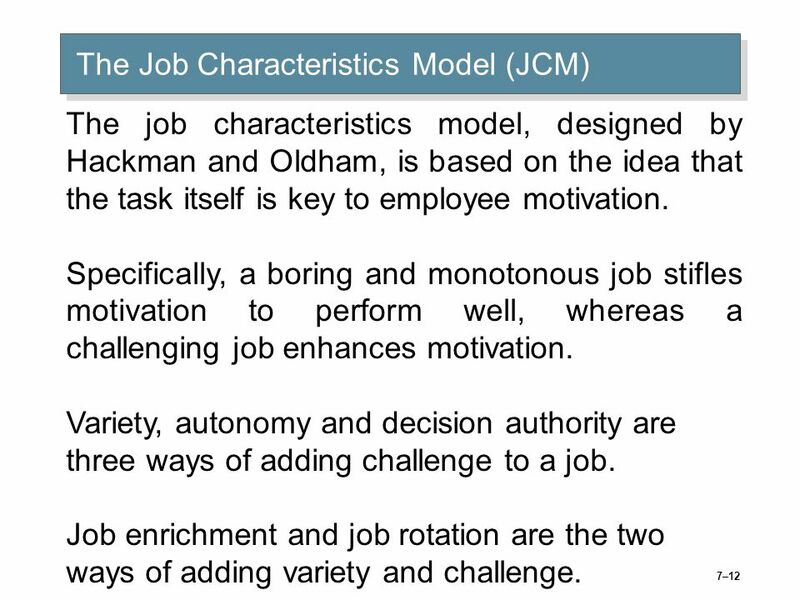 The job characteristics model, designed by Hackman and Oldham, is based on the idea that the task itself is key to employee motivation. Specifically, a boring and monotonous job stifles motivation to perform well, whereas a challenging job enhances motivation. Variety, autonomy and decision authority are three ways of adding challenge to a job. Job enrichment and job rotation are the two ways of adding variety and challenge. Source: J.R. Hackman and G.R. Oldham, Work Design (excerpted from pp. 78–80). © 1980 by Addison-Wesley Publishing Co., Inc. Reprinted by permission of Addison-Wesley Longman, Inc. E X H I B I T 6–6 © 2005 Prentice Hall Inc. All rights reserved. 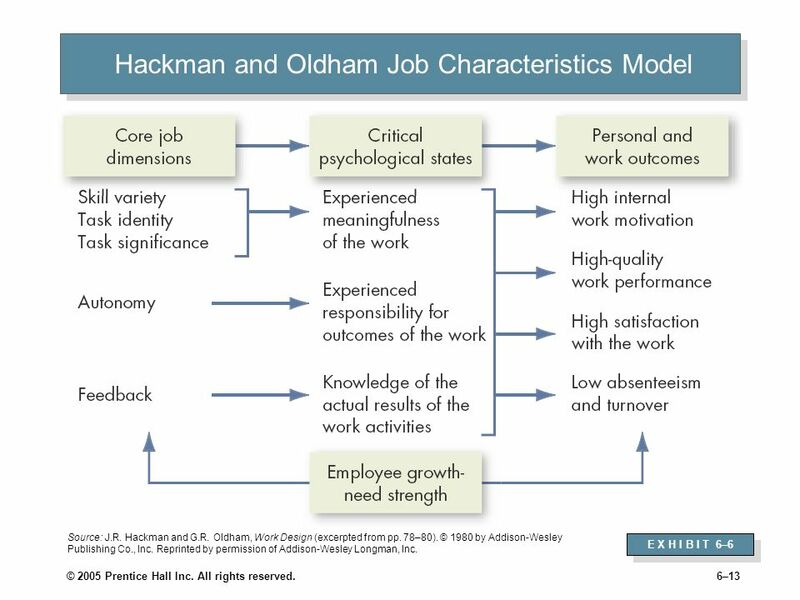 14 Hackman and Oldham's Motivating Potential Score of Jobs Source: Empirically Derived Job Characteristics Measures And The Motivating Potential Score. By: Lee-Ross, Darren. Journal of Management Development, 1999, Vol. 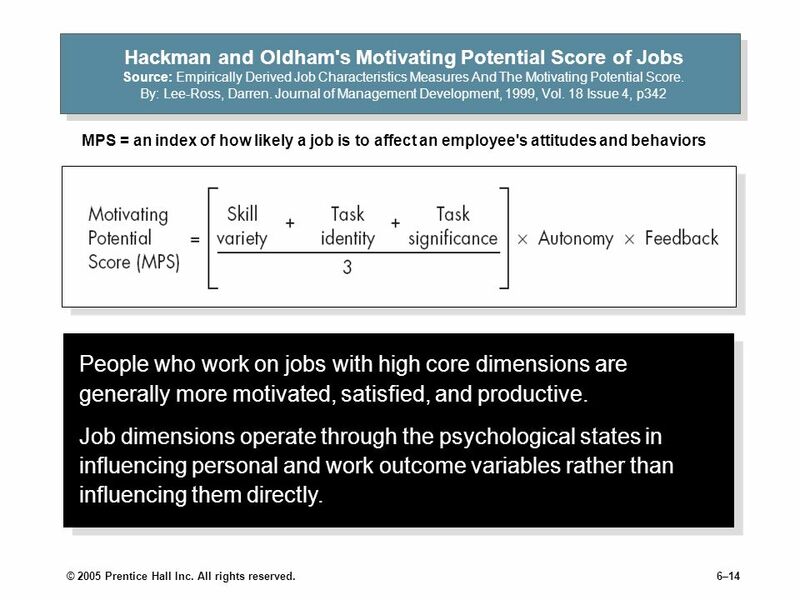 18 Issue 4, p342 MPS = an index of how likely a job is to affect an employee's attitudes and behaviors People who work on jobs with high core dimensions are generally more motivated, satisfied, and productive. 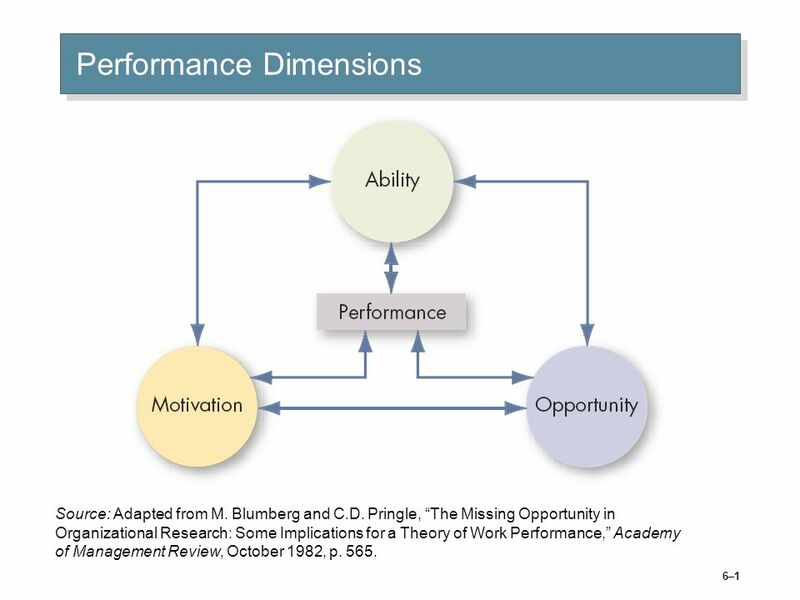 Job dimensions operate through the psychological states in influencing personal and work outcome variables rather than influencing them directly. © 2005 Prentice Hall Inc. All rights reserved. Individuals compare their job inputs and outcomes with those of others and then respond to eliminate any inequities. 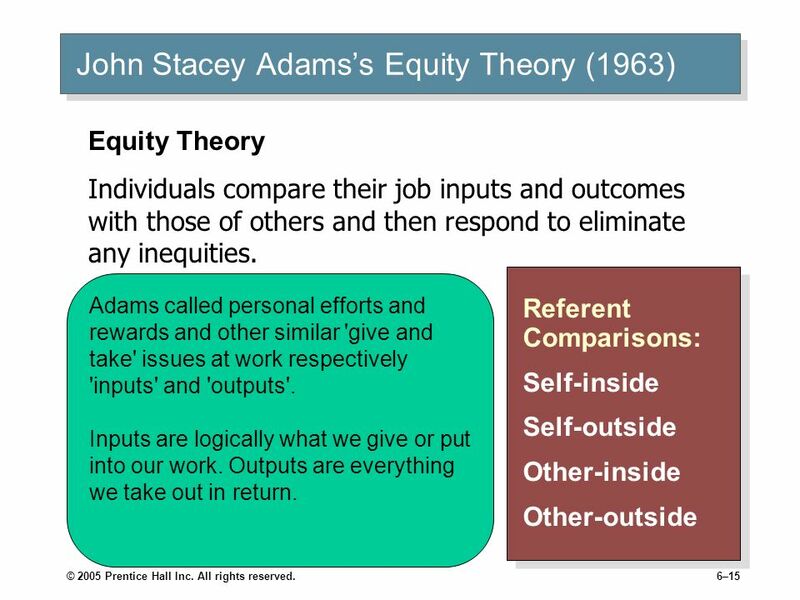 Referent Comparisons: Self-inside Self-outside Other-inside Other-outside Adams called personal efforts and rewards and other similar 'give and take' issues at work respectively 'inputs' and 'outputs'. Inputs are logically what we give or put into our work. Outputs are everything we take out in return. © 2005 Prentice Hall Inc. All rights reserved. E X H I B I T 6–7 © 2005 Prentice Hall Inc. All rights reserved. 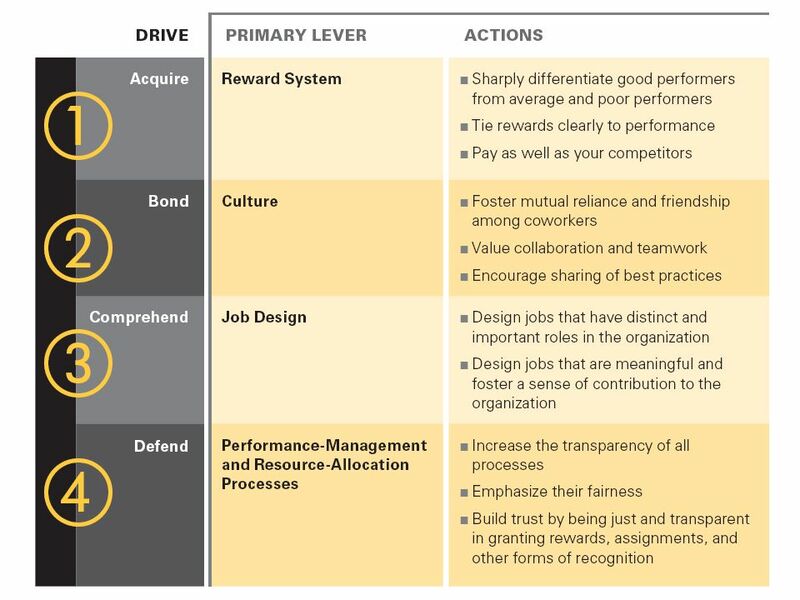 Employee Motivation: A Powerful New Model by Nitin Nohria, Boris Groysberg, and Linda-Eling Lee, Harvard Business Review, 2008 © 2005 Prentice Hall Inc. All rights reserved. 18 © 2005 Prentice Hall Inc. All rights reserved. Motivation Motivation : involves a conscious decision to perform one or more activities with greater effort than one performs other activities competing. Motivation Organizational Behaviour Lecture No. 13 Zain Ul Abideen. 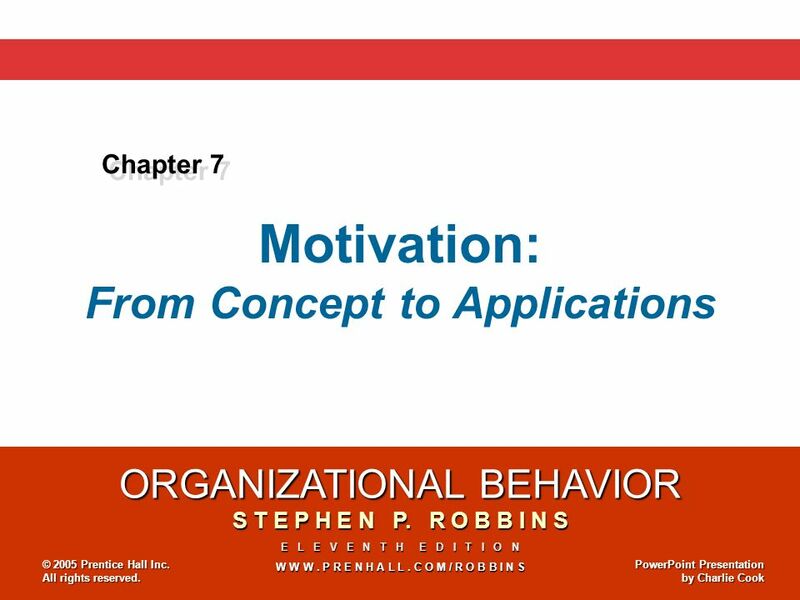 Chapter 6: Basic Motivation Concepts Motivation = “The processes that account for an individual’s intensity, direction, and persistence of effort toward. ORGANIZATIONAL BEHAVIOR S T E P H E N P. R O B B I N S W W W. P R E N H A L L. C O M / R O B B I N S T E N T H E D I T I O N © 2003 Prentice Hall Inc. 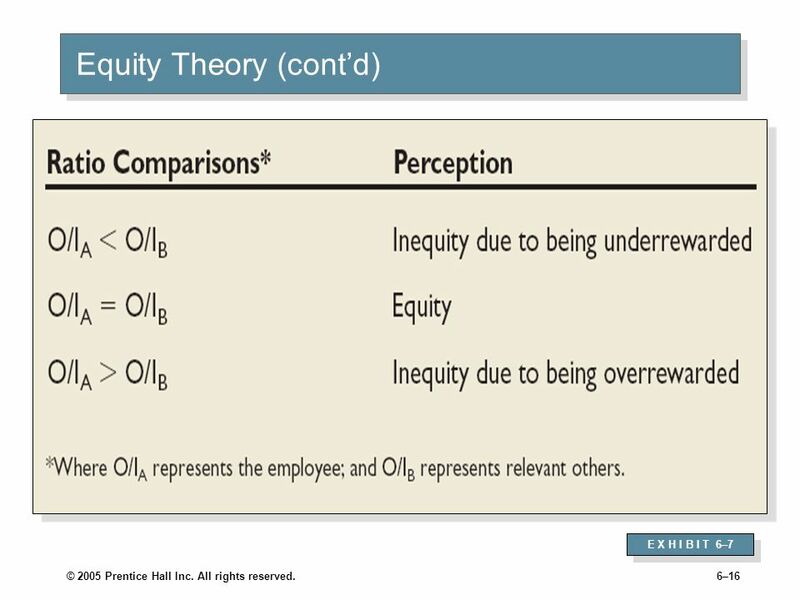 Examples of “Classic” Theories of Work Motivation (Mobilization?) Needs theories Maslow’s hierarchy of needs Herzberg’s two factor theory Aldefer’s ERG. P O L C A Leading.